The process of selecting, promoting and developing effective leaders and professionals is fundamental to the success of any organization. Our research and experience has consistently shown that effective leaders and professionals demonstrate specific behaviors and possess key attributes. These assets clearly impact their organizations’ bottom line and separate them from their less successful counterparts. 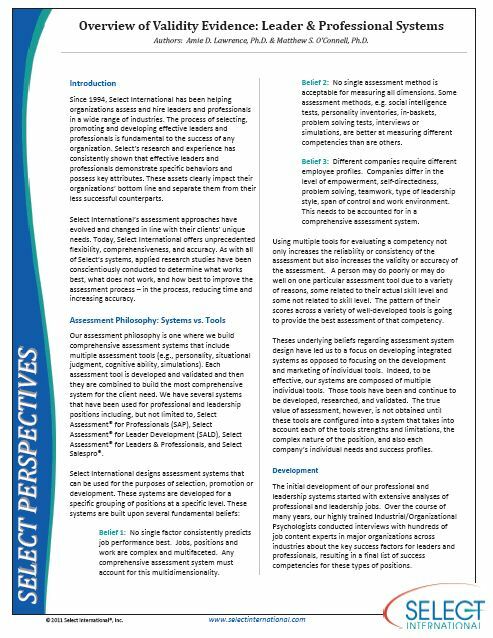 This paper discusses Select International’s philosophy and approach to helping our clients assess and hire these leaders in a wide range of industries.